Deputy Chief Secretary to the President and Cabinet responsible for presidential communications George Charamba (GC) says President Emmerson Mnangagwa's former special advisor, Chris Mutsvangwa, should provide evidence to authorities if he knows of individuals or organisations that are breaking the country's laws. Charamba was speaking to Standard Senior Reporter Obey Manayiti (OM) on Friday in a wide-ranging interview in which he also pointed out the need to draw a line between bona fide whistleblowers and rivals, who he said were trying to fall back on political clout to get the better of competition. Below are excerpts from the interview. 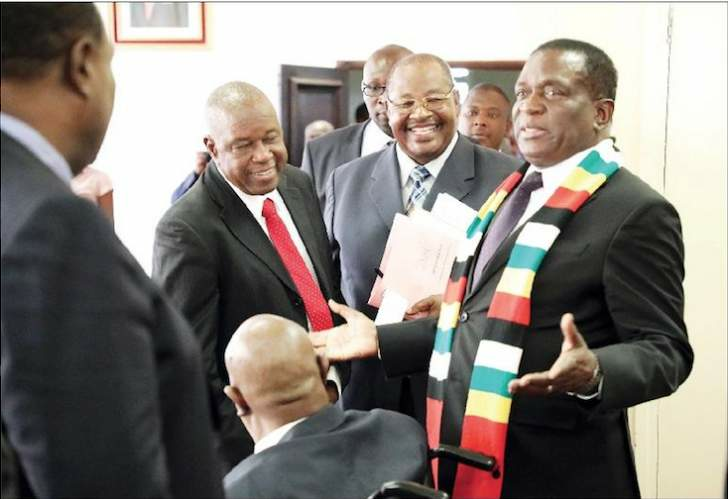 OM: What is President Emmerson Mnangagwa's reaction to his former advisor Chris Mutsvangwa's claims that businessman Kudakwashe Tagwirei has divided the presidium because of what he referred to as state capture? GC: We are done with that issue. From our angle as the presidium, we have pushed enough information. You will be trying to set us against each other. The information is now in the public domain through the institution of the press and we are happy with the level of information that is in the market. Let's move to other matters. There is no point of perpetuating a conflict situation when the matter has been resolved and the information availed to your industry. It doesn't help us. We are running the country and we are father figures and do you really want us to be boxing children every time? no, that is not how we work. OM: Does the president have any business deals with Tagwirei and what is his attitude on allegations that Sakunda Holdings is now a cartel enjoying an unfair advantage in the allocation of foreign currency by the Reserve Bank of Zimbabwe (RBZ)? GC: We are still dealing with the same matter, isn't it? I am literally disinclined to perpetuate any discussion on that matter because from our end, it doesn't help anything. The bottom line is that my corporate communication cannot be advanced by recycling the same questions and the same story. All it simply does is to antagonise persons further and it doesn't help. The bottom line from my perspective is that the fuel situation has stabilised, farmers can go back to work, motorists can be on the road again and thanks to a combination of IPG and Sakunda, the market dominant players, as well as other oil companies. That is our issue, not to say who is in business with who, to us it's small talk and we have no time for that. This country doesn't have oil, it's hoping to have oil and necessarily all oil companies do get funding from RBZ and funding is on the basis of capacity. You must also draw a distinction between monopoly and market dominance because dominance doesn't mean monopoly. Monopoly only arises in circumstances where there are entry barriers which can be legal, institutional or financial, meaning you are literally blocking other players from coming in. In our case, there is no entry barrier. Secondly, cartel, in economic terms, implies collusion, so you cannot identify one person and say there is a cartel. That term means few suppliers of a product are colluding to create entry barriers to competition and so one person cannot create a cartel. Meanwhile, what has caused a change in the market is a combination of BP, ZUVA, IPG and Trafigura who are in partnership with Sakunda and already you have more than five players in the market and how do you talk of a cartel or a monopoly? We import our fuel products, which means ultimately everything is a function of disbursement from the central bank and disbursement is on the basis of the magnitude of your market share. You don't expect company X which has 20 outlets in the country to get the same allocation with a company that has more than 200 outlets. The third aspect is that of the pipeline and the facility at Msasa is government-owned. We actually prefer a situation whereby oil companies are bringing in oil through that pipeline. It is cheaper and that will translate into a discount to consumers. The interesting thing is that the pipeline is not being patronised by the oil suppliers because, here is a critical aspect, the pipeline comes from Beira to Zimbabwe and for that whole distance it means at one time there is fuel covering that whole distance which is dead in the sense that it cannot be emptied. Let's say for argument's sake, that whole distance contains two million litres of fuel, if you want to use that pipeline it means you have to be ready to import four million litres because the other two million will remain in the pipeline and those who have done transport economics will know that. This is one disadvantage as a supply route as opposed to road. You now go to the capitalisation level of the companies that we have and you will look at the capacity of those that have the capacity to do double the requirement to then be able to keep the other half in the pipeline and that is why most of these people do not want to use the pipeline and prefer to use road. So this issue is not about monopoly or privatising state assets, but quite the contrary. Government would want the oil companies to use the pipeline because it's cheaper, because it doesn't destroy the road infrastructure. You cannot keep the pipeline empty, you have to keep as much inside as you are pushing out, otherwise it will mean you will need some few days to just pump out air before discharging a product. The ideal thing was to say NOIC (National Oil Company of Zimbabwe) should have been running the pipeline and everyone would be taking from Msasa. In other words, they would be on the retail side of the product, but now the trouble is that NOIC, with the difficulties that we have of getting foreign currency cannot keep orders twice the requirement because we don't have the foreign currency and these guys, Trafigura, are using their own funds and that is why they can afford to give us 100 million litres to be paid a year later, something that other companies cannot do because they are dependent on disbursements from RBZ. OM: Still on that issue, how will the government repay the 100 million litres of fuel that Sakunda reportedly loaned it to address the shortages? Is the government not mortgaging the country's resources to Sakunda and its Singapore partners? GC: Let me give you an analogy. in life there are some things that are not postponable. Think of your own home and if you don't have basics and you go to your neighbour to get help where the alternative is to die. Consumption never gets to zero, so whether be it Sakunda, PB, Engen or whatever company, short of grounding this economy to a standstill you have to have fuel and you have to find ways of retiring the debt so the issue that you are raising cannot arise because what is the alternative? it will be to shut down industry. OM: But the manner in which you are doing this, is it not mortgaging the country to Sakunda or its partners? GC: We are already mortgaged and if it was not Sakunda, it was going to be another company. As long as you are not an oil-producing country you are already mortgaged anyway and what is the point? Don't get caught up with the politics that who are you indebted to because that is a foolish argument. The point is you cannot avoid being indebted because you don't have the product. What we have is a line of credit and Zimbabwe has been for a long time on a cash budget and very few friends will be able to give you a line of credit as has happened with Sakunda. We must say Hallelujah, fuel is an unavoidable expenditure. OM: Still on that issue, that is where Christopher Mutsvangwa alleges that most of the foreign currency allocated to Sakunda finds its way to the black market where RTGs is used to pay back the RBZ? GC: Except Mutsvangwa is Zanu-PF, he is past advisor of the President and he has also been a government minister. And when you see a law being broken, you don't shout from the rooftop, you go with the evidence to the arresting powers, to the investigating authorities. That is where we differ with our colleagues. Go and provide evidence because culprits are not dealt with by headlines, but they are dealt with by handcuffs and if he has got some information, please can he help the system? It's not that if you are fronting a rival planning to bring fuel, then you retreat in the political deck because you cannot stand the heat in the boardroom, no, that is not acceptable. We have made this information available to you that draws the line between bona fide whistleblowers and rivals who are trying to fall back on some political clout to get the better of competition. We are saying to you the doors are open, the market is open and get in the market together with your people and compete with others just like any other person. When you get blooded, we say sorry and you win we say, hallelujah and not try to use fake politics. Mining, Oil and Gas Service (MOGGs) is one of the suppliers and the President has met with the executives and what is stopping them now? We also ask you that if Sakunda were to vanish and MOGGs had to appear we will have the same character saying that MOGGs has created a monopoly or a cartel. This is why Rupert Murdoch said "A monopoly is bad until you have it" and so what we are looking at is not a Christian voice, it's just a fight for the fuel cake in Zimbabwe, but we are saying please don't involve us, it's a market question and solve it there. OM: Finance minister Mthuli Ncube announced that the government needed to let the private sector run command agriculture, but the Air Force commander last week said the programme was here to stay. Is that not a sign of discord in government? GC: Command agriculture has always been privately-financed with government playing a role of a guarantor, so the contract between a farmer and the input supplier is between the farmer and Grain Marketing Board (GMB) with GMB being the vehicle to guarantee private sector funding. GMB is the market for the farmer and so it means that it can be a collection agency for the private sector parties who would have extended resources through GMB to the farmer. If you are on a command agriculture contract, you cannot side-market and there is a legal provision in the market to say so. When you have supplied GMB, you are required to sign stop order forms before you get your money from GMB so that GMB deducts the value of the inputs that a farmer collected for on-payment to the private supplier of those inputs. Last week the President raised concern on deputy chief secretary Justin Mupamhanga, who is in charge of command agriculture, that he was not happy with the rate of defaulting in command agriculture by the farmers and from now onwards if the farmer hasn't showed commitment to honour debts, then they must be removed altogether from the project. Therefore, there is no contradiction between the Finance minister's statement and a statement from the official you are referring to. What will certainly change are the names of farmers who are eligible for funding under command agriculture, not the concept of command agriculture. It is the best that has happened. OM: But people like Mutsvangwa also decried the involvement of the army in command agriculture. As government, do you share the same sentiments? GC: We don't think the former advisor meant it, we don't think so. Does he really want to share the same argument with (former minister) Jonathan Moyo? That is Jonathan Moyo's argument and I don't think he wants to because I know he doesn't want to.